Decorative, low-profile, architectural die-cast aluminum emergency lights, high performance outdoor / indoor LED emergency lighting. - Architectural low-profile decorative oval shape design. - Die-cast aluminum housing emergency light, indoor or outdoor lighting. - Integrated test switch/pilot light. - Polycarbonate lens and mirror reflector. UL 94V-0 flame rating. 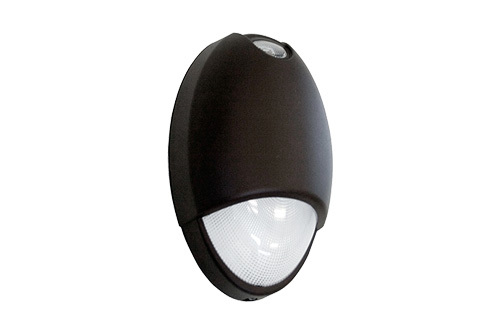 - Die-Cast aluminum housing with durable powder coat finishes in white, black and dark bronze. - Photocell sensor included as a standard. - The unit is illuminated by efficient ultra-bright white LED lamp. - LED lumen maintenance life: 50,000 hours. - Wall or Ceiling conduit mounting. - Surface mount via easy connect back plate that fits most standard size junction boxes. - Conduit mount via rigid conduit entry provision on top of the unit. - 120/277VAC dual voltage operation. - Charge rate/power “ON” LED indicator light and push to test switch for mandated code compliance testing. - Maintenance-free, 6V 5 Ah rechargeable Ni-Cad battery provide more than 90 minutes discharge time to emergency source. - Internal solid-state transfer switch automatically connects the internal battery to LED board for minimum 90-minute emergency illumination. - UL listed for wet location. (0°- 50°C /32°F-122°F). CW option UL listed for wet locations (-20°- 50°C/-4°- 122°F). - Five year warranty on all electronics and housing. Batteries pro-rated for five years. - Meets UL924, NFPA 70, NFPA101 Life Safety Code, NEC, OSHA, Local and State Codes.